Performing with style and commitment, the Sacconi Quartet is known throughout the world for its creativity and integrity of interpretation. Formed in 2001, its four founder members continue to demonstrate a shared passion for string quartet repertoire, infectiously reaching out to audiences with their energy and enthusiasm. The quartet enjoys a highly successful international career, performing regularly throughout Europe, at London’s major venues, in recordings and on radio broadcasts. The Sacconi is Quartet in Association at the Royal College of Music and Associate Artist at the Bristol Old Vic. The Quartet has given over twenty world premières and British premières, including works by Graham Fitkin, Jonathan Dove, John McCabe, György Kurtág, Paul Patterson, Simon Rowland-Jones, John Metcalf and Robin Holloway, and they performed as the solo string quartet on Paul McCartney’s hit song Come home. The quartet has been joined on stage by countless musicians including Pekka Kuusisto, Freddy Kempf, Melvyn Tan, Simon Crawford-Phillips, Vladimir Ashkenazy, Guy Johnston, Alasdair Beatson, Tom Poster, Matthew Rose, Bellowhead’s Jon Boden and actor Timothy West. The Quartet’s Sacconi Chamber Music Festival in Folkestone is an established event in the cultural calendar and is expanding year on year with challenging programming and exciting collaborations. Firm believers in the importance of bringing chamber music to the next generation, the Sacconi Quartet dedicates much passion, time and energy to education work. They regularly lead workshops and give school and family concerts as part of the Sacconi Chamber Music Festival outreach programme and the CAVATINA Chamber Music Trust. 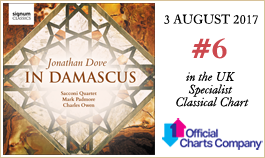 In Damascus, their album of music by Jonathan Dove including In Damascus, commissioned by the Quartet, and featuring Mark Padmore and Charles Owen, hit the Classical Top Ten and was chosen as Gramophone magazine’s Recording of the Month: 'This important release cannot be recommended too highly.' The quartet’s recording of Beethoven Op 132 and Mendelssohn Op 13, the fi rst commercial pairing of these closely related works, was released on Sacconi Records in 2016, and received a 5-star review in Classical Music. The previous release, a disc of Czech quartets, was received with widespread critical acclaim and is regularly broadcast on BBC Radio 3 and Classic FM. The quartet’s debut recording of Haydn’s Op 54 quartets was praised in the press and both their Ravel and Haydn CDs were featured in The Full Works programme on Classic FM. They have also recorded for Signum, NMC and Champs Hill Records, and their 2006 Naxos recording of Finzi’s song cycle By footpath and stile with baritone Roderick Williams was well received in all the national broadsheets and BBC Music Magazine. The name Sacconi Quartet comes from the outstanding twentieth-century Italian luthier and restorer Simone Sacconi, whose book The secrets of Stradivari is considered an indispensable reference for violin makers. Ben Hancox plays a 1932 Sacconi violin and Robin Ashwell a 1934 Sacconi viola, both made in New York. Hannah Dawson plays a 1927 Sacconi violin made in Rome, and Cara Berridge plays a Nicolaus Gagliano cello from 1781. Ben, Hannah & Cara have all been generously loaned these instruments by the Royal Society of Musicians, a charity which helps musicians in need, for which they are extremely grateful. Robin is indebted to Ellen Solomon for the use of his viola.